I am excited to share the news with you netizens that Firefox has launched the India Uses Firefox Nightly (#INUsesFxNightly) campaign in India. The mission of this campaign is to increase the usage of Firefox Nightly in India. There are many Indians who use and support Firefox but aren’t aware of how to contribute back to its development. Firefox Nightly is nothing but a pre-release version of Firefox which allows you to test brand new features which usually aren’t available in the regular builds. Moreover, these Nightly builds send feedback automatically to Mozilla which will help them to better assess the usage statistics and application’s stability on your device. 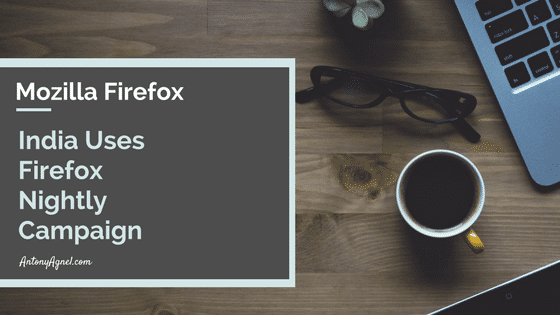 Information about the app usage, performance, responsiveness statistics about user interface features, memory, and hardware configuration along with your IP address is securely transmitted back to them to help improve the future versions of Firefox. Once sent to Mozilla, these usage statistics are aggregated and made available to a broad range of developers, including both Mozilla employees and public contributors. It doesn’t take much technical knowledge to get started with this campaign. There are so many way for you to get involved in this campaign such as asking a friend to install nightly on his device (phone or PC), spreading the news on social networking sites, using the #INUsesFxNightly tag when sharing related posts on Twitter, Facebook and Instagram, writing a blog post encouraging your readers to install Nightly, hosting a webinar, giving a short talk in front of your class on why they should use Nightly, installing Nightly on your personal computer or smart phone, installing it on computers in your school/college computer labs, etc. These are just some of the many ways on how you can promote the usage of Nightly in India. If you’ve got any other suggestion, please do feel free to share it in the comments section.